Mount Mitchill Scenic Overlook has always been a special place to view the New York skyline and the Sandy Hook Bay. The tall ships, fireworks over the East River, and sailboat races are great to watch from this "highest point on the Atlantic Coast." In September 2001 the park took on a new meaning for many in Monmouth County. There were 147 people from Monmouth County who perished in the terrorists attacks of September 11th, 2001. For days and weeks afterward, people visited Mount Mitchill to reflect and remember. 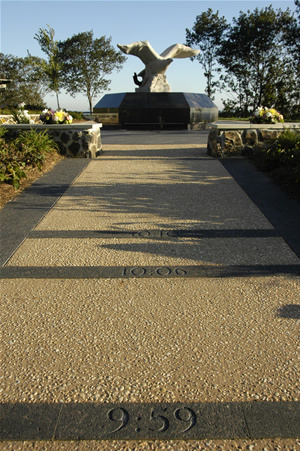 In 2002, the Monmouth County 9/11 Committee formed and began making plans for a fitting tribute to the victims, heroes, and events of September 11th. The group’s first responsibility was to select a memorial to fit into Mount Mitchill Scenic Overlook. The 9/11 Committee then embarked on a major fundraising effort to finance the Memorial. By midsummer 2005 the group exceeded its goal by raising $296,000. 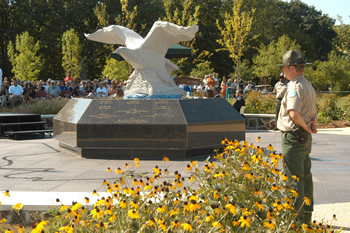 Continued donations will support the upkeep and maintenance of the Memorial. changes to the famous skyline as it was once known and honors both the lives lost and the fearless display of heroism by rescue teams and citizens who responded to the tragedy. The 9/11 Memorial Timeline walkway represents a three hour time span of the tragic morning of September 11, 2001. That day, 2973 innocent lives were lost in what is now known as the most devastating attack on American soil. This Memorial commemorates 147 people from Monmouth County who perished as a result of the attack. The day began like any other day. FROM GARDEN STATE PARKWAY: Exit 117, follow Hwy. 36 East (about 13 miles) to jughandle signs for "Red Bank/Scenic Road." Follow signs to Park. FROM SANDY HOOK/SEA BRIGHT: Hwy. 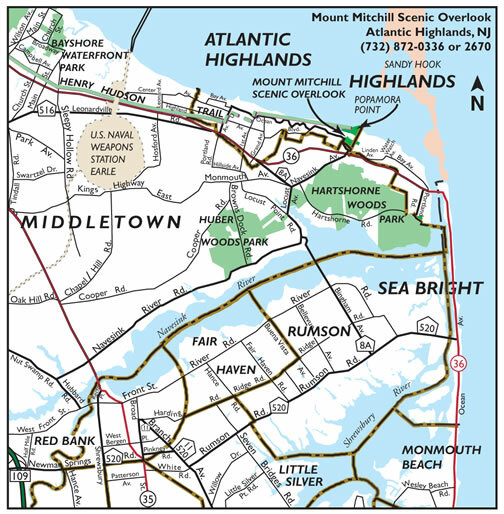 36 (Ocean Ave) North over Highlands Bridge to Navesink Ave./Scenic Road. Stay to right and follow signs to Park.